Our physicians understand that chronic pain and emotional difficulties are often closely intertwined. 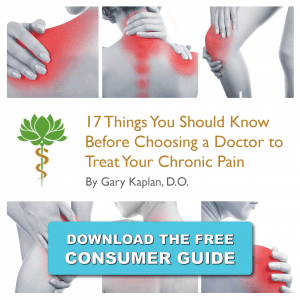 In diagnosing your pain problem, your Kaplan physician will take time to assess not just your physical symptoms and your overall physical health, but also your emotional state, your cognitive functioning and your situational-stress level. Sometimes emotional issues have become so bound up with a physical disorder that psychotherapy or stress management is essential to a patient’s recovery. The Kaplan Medical Team includes Jodi Brayton, a psychotherapist who helps patients work through a wide range of emotional issues from anxiety, grief, anger and post-traumatic stress syndrome, to work and family difficulties. So, when a patient needs or wants to address the emotional components of their pain, the Center has a variety of services available, including supportive therapy, psychodynamic and cognitive therapy, pain-management therapy, and EMDR (Eye Movement Desensitization & Reprocessing). Psychotherapy can help individuals become more aware of their own thought processes, so they can begin changing negative thoughts and more effectively manage stressful life situations, such as family and interpersonal issues, including dealing with a difficult colleagues or supervisors at work. Using a pain-management protocol, our counselors can help patients learn ways to reduce their perception of pain, including the frequency, intensity or quality of painful sensations. This therapeutic approach strives to help patients both resolve their emotional pain and reduce their perception of their physical pain. After participating in pain-management therapy, patients often find themselves feeling well enough to return to the activities that they enjoy and that give meaning to their lives. At your first appointment, your Kaplan physician will evaluate the following components of your health. Your emotional well-being is an important component of you attaining optimal health. Family/Genetic History allows your doctor to understand your symptoms in the context of your family’s medical history. Medication/Surgical History gives your doctor information that he or she needs to understand medical problems you’ve experienced in the past, how your body responded to the surgery or medication, and how that history might be affecting your present health problems. Social History provides your doctor with important information about past experiences and situations that may be still impacting your health. Work and Recreational Activities can provide positive opportunities for social support and physical exercise; however, work can also represent exposure to environmental toxins and situational stress. Physical Exercise Habits are important in keeping the body healthy, although they can also put a strain on the musculoskeletal system. Sophisticated Blood Tests indicate whether you have an infection, anemia, allergies, a proper electrolyte balance, and proper kidney and liver functioning, among many other functions. Urinalysis reports on blood in the urine, as well as any inflammation, bacteria or infection. Sleep History/Sleep Disorder Study* provides your doctor with information about your sleeping habits and problems. At first glance, sleep may not seem to be related to your medical problems, but upon examination, it may be profoundly affecting your health. Emotional Well-Being Assessment allows your physician to understand your emotional life – including how your medical problems may have affected your ability to work, engage in relationships, and enjoy recreational activities. It is important for your physician to know if chronic illness has undermined your self-esteem or if emotional problems have contributed to your physical problems. Stress Management and Current Pain Level Evaluation provides information about important factors that might affect your diagnosis and treatment. * When a sleep study is necessary, we provide trusted outside referrals.